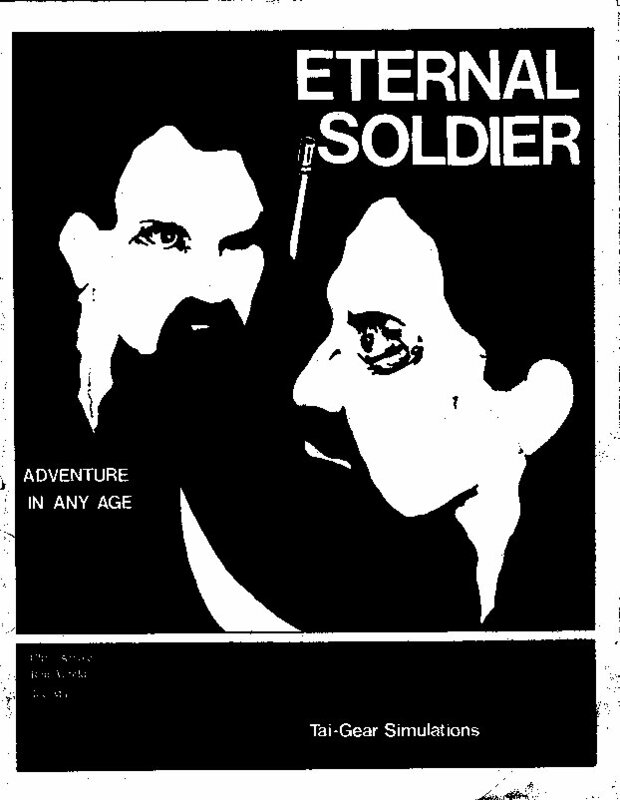 Eternal Soldier was a product I accidentally stumbled across while wandering the show floor at GenCon in 1987 or ’88 (not entirely sure which). It was never widely distributed as far as I’m aware: the publishing company was essentially a small start-up formed to publish the rule set and see if it would sell (the best kind, IMO). They didn’t end up hitting the jackpot, unfortunately, but they did create an interesting little game. It’s essentially a “home-brew” rule system in book form, and as such has some interesting little twists I’d never run across in any other title before (or since, in some cases). The attributes of Eternal Soldier are fairly straightforward, and the influence of D+D/D20 is fairly obvious: base scores for new characters are generally determined by a roll of 3d6. The specific selection of scores is fairly typical and reminiscent of D+D as well, with the distinction of separating Dexterity into Agility (quickness/balance) and Dexterity (hand-eye coord), and Charisma into Charisma (personality) and Comeliness (appearance), both quite common in games of the era. Eternal Soldier uses a fairly standard hit point model as well, diverging from D+D/D20 in that hit point totals are based entirely on attribute scores (CON score+STR bonus, 3-22 or so): there is no automatic increase for gaining levels or other such mechanism. The general impact of that kind of system is an increased sense of vulnerability, almost a critical hit paradigm: a single blow can put even a long-played character down for the count under the right circumstances. The manner in which skills are calculated is one of the interesting little twists of the game. Each skill is defined with 5 related attributes: for example, One-Handed Weapon skill is defined as Strength x1, Agility x2, Dexterity x2; while Mimicry is defined as Intellect x2, Charisma x3. These attributes are combined to determine the related “aptitude” score for the skill. A character with an Intellect of 15 and Charisma of 12, for example, would have an Aptitude in Mimicry of ((15 x 2)+(12 x 3))/10=6.6. The 6.6 represents a multiplier to the number of skill ranks purchased, determining the character’s Skill score. Thus, the above character, if he had purchased 12 ranks of Mimicry, would have a score of (12×6.6=) 79.2 rounded, or 79% in Mimicry skill. Skill ranks are purchased with XP. The cost per rank is determined by how many ranks have previously been purchased: the first rank in a skill costs 100XP, the second 200XP, and so on. Skill checks are a simple matter of rolling d100 and comparing to the skill score. If the roll is less than the skill score (adjusted for circumstances, of course), the character succeeds. It may seem like a trivial point now, but the impact of applying attribute adjustments as a multiplier as opposed to an addition was actually a rather unique concept at the time, and it does have an impact on play, increasing the relative importance of experience in comparison to high attribute scores, especially early on in the campaign. The combat system, and entire resolution system for that matter, is interesting in that it is similar to the Car Wars phased resolution system. That was pretty rare at the time: most games were still strongly turn-based. 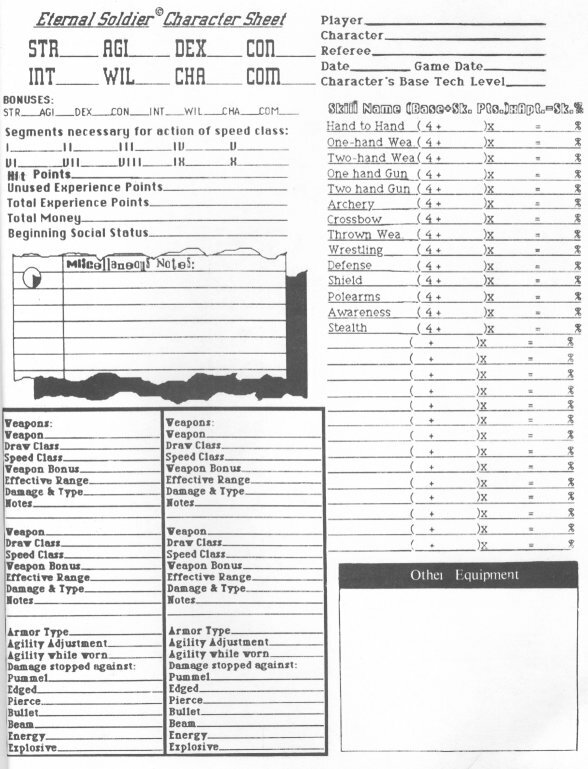 Every action a character might take is rated with a Speed Class, generally falling between 1 and 10: for example, Speed Class IV (4) includes example actions such as “get something out of pocket”, “write 1 word”, and “strike match”. Weapons have 2 Speed Class ratings, a Draw Class (how long to draw the weapon) and a general Speed Class (how long between swings). Missile weapons also have a Reload Class which measures how long it takes to reload. Once the Speed Class of an action has been determined, the actual time for any particular character to perform that action is calculated via the formula (SC x 10)/AGI, where SC is the speed class and AGI is the character’s Agility attribute score. This yields a number of “segments”, each roughly equivalent to about 1/2 second, which must pass before the action will take place. Hectic activity in the game, like combat, becomes a very fluid process under this system. As the situation changes, players will change actions in mid-attempt, delay actions to attempt to time for maximum effect. The option to attempt to “quick attack” is also presented, with a cumulative penalty applied for each segment the player attempts to shave off the required time. Beyond the initiative system, the combat system is fairly standard and straightforward. There are optional rules for critical hits, shock, and the like, but the basic “roll-to-hit, then roll-for-damage” paradigm is pretty much at it’s core. The rules for armor are a bit different, with different armors stopping variable amounts of damage based on the type of attack: Chain Mail is defined as stopping 2d4 pummeling damage, 2d6 piercing damage, 2d8 edged damage, 1d6 energy damage, and so on. (A similar concept was used in Chaosium’s Elric/Hawkmoon/Eternal Champion titles.) An Agility penalty also applies to certain armors (which correspondingly slows the character’s actions via the initiative system, it should be noted). There are rules for guns, spells, beam weapons, wrestling and judo and the like, as well. It’s a nice tight little system overall, IMO. This was actually a fairly early example of the trend toward generic rule systems which first emerged in the mid-80s, represented most prominently now by systems like GURPS. There was no official setting or sample scenario available at the time: the book was really designed as a system for GMs to apply to their own campaign setting. I lost track of the company and product for several years, only rediscovering a connection to it in the late 90s when I stumbled across a small mail-list group organized around the title. Unfortunately, it was relatively inactive, and seemed to disappear as well a couple of years after I found it. However, a quick google search revealed that the original designers are definitely still around, and have made the entire ruleset (possibly with additional material over and above what I currently have in paper form) available for free download at www.tai-gear.com. If you like pen-and-paper RPG systems, I definitely recommend stopping by and giving it a once-through (an activity I will be undertaking as soon as I finish this post, heh). Onward!